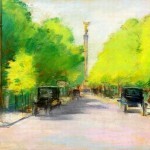 (Leo) Lesser Ury was a German impressionist painter who followed his own style and is perhaps most well known for his skills with pastels – some consider Ury one of the most important pastellists of the 19th Century. Ury traveled throughout Europe for a number of years perfecting his skills as an artist. He was in Brussels and Antwerp in 1880. 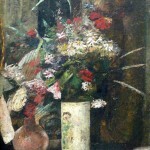 He spent time in Paris painting floral still lifes, city scenes and interiors during 1881. The Academie Royal des Baues-Artes in Brussels was where he stopped in 1882 and in 1883 he was in Paris. Stops in Berlin, Stuttgard and Karlsruhe followed in 1885. Ury returned to Berlin to stay in 1887. 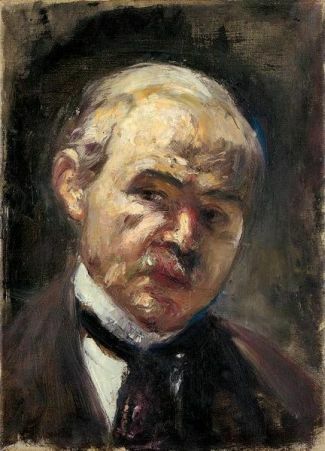 Fritz Gurlitt hosted Ury’s first show in 1889. His work was met with much criticism but Adolphe von Menzel convinced the Akademie to award Ury the Michael-Beer-Preis. The award funded further travels to Rome and Capri. 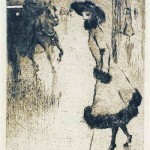 The artist returned to Berlin in 1893 when 67 of his paintings were featured in a one man show. That same year he joined the Munich Secession and began working for the journal “Das Narrenschiff” (Ship of Fools). 1901 saw Ury returning to Berlin and meeting Meta Streiter. Streiter would become his model and muse. He had his first exhibition at the Berlin Seccession in 1915 and six years later became an honorary member of that group. In 1922, a great exhibition was held in honor of the artist’s 60th birthday and featured 150 of his works. He died in 1931, missing an exhibition in honor of his 70th birthday at the National Gallery in Breslau in 1932 by only three weeks. Ury’s work often features rainy streets and figures in café interiors. 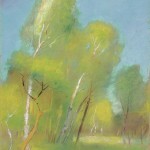 His paintings, while a study of the effect of light, are somewhat gloomy and dark but maintain a sense of natural beauty. His early work was influenced by the French Impressionist style but most feel he worked in a style much his own and consider his later pieces to be more post-impressionistic. The German art community, perhaps influenced by the German Reich’s nationalistic tendencies, distrust of things foreign and rising anti-Semitism, didn’t really come to appreciate his talent until just before his death. Sadly, the Nazi’s would destroy many Jewish works of art including much of Lesser Ury’s body of work.